Two faculty members have been awarded nearly $1 million to help improve computer science education in high schools, as the College also adds a new computer science education certificate for teachers. The National Science Foundation has awarded $999,741 to St. Scholastica's Jennifer Rosato, assistant professor of Computer Information Systems, and Chery Takkunen, associate professor and chair of graduate education programs for the School of Education. The grant funds will be used to improve and expand K-12 computer science education. This addresses a major need in American schools, Takkunen says. The funds will be used to create and offer an online course for teachers, to pay stipends to teacher participants, and to offer ongoing support and mentoring during the school year. The course will show teachers how to help their students to develop mobile apps, Rosato said, because building apps for smartphones and tablets is a relatable way to get kids excited about computer science. Participating teachers will first go through the program as a student would. Next, they're given detailed materials, including lesson plans and videos, to implement the program in their schools. That's critical because even if teachers attempt to teach computer science, they have a hard time finding course materials. Across the country, programs like this one are extremely rare. Throughout the program, teachers will have the chance to work with mentors on a 10-1 ratio for extra help. The final phase of the course includes providing academic year support to teachers implementing this program for the first time. Teachers don't always get such support with other professional development opportunities, Rosato said, and it is key to helping them to master the material. The three-year program will start next summer, offering 30 slots in its first year, 60 slots in its second year, and 90 slots in its final year. It's free for teachers, and they'll actually receive a grant-funded stipend for their participation. The application deadline is March 1, 2015. To learn more about getting involved in the new computer science course, visit css.edu/CSworkshops. St. Scholastica is also offering a new computer science education certificate, starting in the summer of 2015. 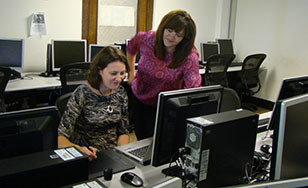 The 12-credit program is taught entirely online and is available to teachers across the nation. Teachers who are in St. Scholastica's online Master of Education program can also use this certificate as an elective strand. The certificate curriculum incorporates elements of diversity, with a goal of getting girls and students of color involved in computer science. For more information about this new certificate, visit css.edu/CSedcert.